Type-304 satin finish stainless steel with all-welded construction. Unit holds two standard-core toilet tissue rolls up to 5-1/4&apos;&apos; (135mm) diameter (1800 sheets). 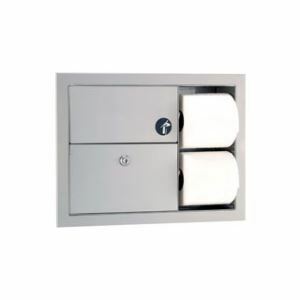 Receptacle unlocks with key provided and slides out for servicing. Capacity: 3/4-gal. (2.8-L). Type-304 satin finish stainless steel with all-welded construction. Unit holds two standard-core toilet tissue rolls up to 5-1/4&apos;&apos; (135mm) diameter (1800 sheets). Receptacle unlocks with key provided and slides out for servicing. Capacity: 3/4-gal. (2.8-L). Unit is 17 3/16" W, 12 3/4" H, 4 1/4" D (435 x 325 x 106mm). Rough Wall Opening: 15 5/8" W, 11 1/4" H, 4" minimum recessed depth (395 x 285 x 100mm). Special Finishes are available for this unit. Go to the Special Finishes page for more information.